In his search for a long-term foreign policy achievement that can offset Iraq in the history books, George W. Bush has returned to a central national security tenet of his early days as President: the need for missile defense. Beyond fighting terrorism, no issue is more important to the President's strategic vision, and he and his closest advisers have pursued anti-missile programs from the earliest days of the Administration. But as he presses his efforts to get a regional missile defense system in train for central Europe before he leaves office, Bush faces more resistance than he bargained for, resistance that now threatens to overshadow his other foreign policy legacy efforts. The biggest obstacle comes from Moscow, where President Vladimir Putin told reporters this week that Russia might again target countries in Europe that accept such a system. "If a part of the strategic nuclear potential of the United States appears in Europe and, in the opinion of our military specialists, will threaten us, then we will have to take appropriate steps in response," Putin said in comments released Monday by the Kremlin. "What kind of steps? We will have to have new targets in Europe." Russia's Cold War rhetoric is set to disrupt an otherwise carefully orchestrated G-8 summit this week in Germany where Bush had planned to highlight global development efforts, a new climate change program and trade negotiations. It also threatens to fracture already weak European support for missile defense. Bush will meet Putin Thursday in Germany, and again early in July at Kennebunkport as part of the effort to reassure the Russians that missile defense is aimed not at undermining Russia's deterrent capability but at combating regimes like Iran's that are developing missile arsenals and are hostile to the U.S. In Prague today, Bush said, "I look forward to having conversations with President Putin, not only at the G8, but in the United States when he comes over. And my message will be, Vladimir  I call him Vladimir  that you shouldn't fear a missile defense system." Bush followed up on the offer to collaborate with Russia on missile defense that his Secretary of Defense Robert Gates made recently in Moscow. 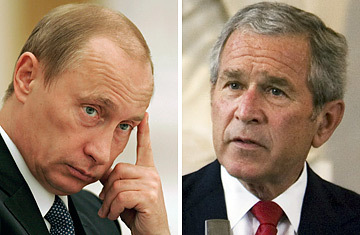 Bush said he'd tell Putin, "Please send your generals over to see how such a system would work. Send your scientists. Let us have the ability to discuss this issue in an open forum where we'll be completely transparent." In fact, the success rates of U.S. missile defense systems are marginal at best. And the most optimistic projections put deployment in Europe more than five years away. Yet if that should reassure Putin, it hasn't. He and the Russians see the deployment as both a potential future threat to their missile arsenal and as an affront to their national security akin to the American view of Khrushchev's deployment of nuclear missiles in Cuba in the early 1960s. So if the systems, which aren't even ready yet, are causing so much agitation in Russia, why is the Administration pushing as hard as it is on the issue now? For starters, Bush's top advisers are all graduates of the school of Star Wars, old national security hands who in one form or another cut their teeth on the issue as young policymakers. National Security Adviser Stephen Hadley pursued missile defense with the Soviets as an arms control negotiator in the administration of George H. W. Bush. When he became George W. Bush's deputy National Security Adviser in 2001, he kept a small model of the Soviet ballistic missile arsenal near his desk and spent his first nine months so focused on getting a rollback of the anti-ballistic missile treaty that he was later accused of ignoring the terrorist threat as it built in the run-up to 9/11. Defense Secretary Robert Gates and Secretary of State Condoleezza Rice were both Russia experts at George H. W. Bush's National Security Council, and pursued the issue as closely as Hadley did. Rice and Hadley also schooled Bush himself on the importance of missile defense during his campaign for the Presidency in 1999 and 2000. On the theory that no weapons system has ever been developed that has not eventually been used, Hadley and others argue that missile defense is a necessity in an era of proliferation  one component of a defense that also includes deterrence and coercion. If the systems to be deployed by the U.S. have had low success rates against missiles thus far, they argue, all the more reason to continue our commitment to the program, in order to accelerate technological progress. Critics say the rush to deploy a system before it's ready and in the face of the opposition of nominal allies is unnecessary, expensive and damaging. They say unilateral agreements between the U.S. on the one hand and Poland and Czech Republic on the other cause friction with other European countries and undermine support for missile defense. And they argue that Bush's insistence on pursuing deployment agreements now shows that the current push is less about the imminent threat than it is about his legacy. "Bush wants to make an irreversible move forward before he leaves office," says Charles Kupchan of the Council on Foreign Relations. "He wants this to be in train even if not completely deployed." Despite those criticisms and Russia's objections, however, Bush is in a good position to advance his missile defense agenda. At home, there is no real opposition to missile defense  mainstream Democrats since Bill Clinton's presidency have shied away from dissenting over missile defense. And abroad there is some willingness to go along with the U.S. in the face of public resistance. Czech President Vaclav Klaus today said he supported Bush's program, despite 60% disapproval among Czechs. All of which means that even threats to target European countries are unlikely to shake the U.S.'s will to deploy, setting the two countries on an increasingly tense course for the final 18 months of Bush's Presidency.